Knowledge of the presence of abnormally-high pressure zones (AHFP) prior to drilling into them can prevent considerable economic losses and, possibly, save human lives. The various origins (undercompaction, tectonics and others) of AHFPs are discussed in this text, followed by the description of predictive techniques in clastic, carbonate and salt-bearing formations. In addition to the well-logging predictive techniques, the authors discuss smectite-illite transformation and the chemistry of interstitial solutions. Other topics covered include (a) abnormally low formation pressures and subsidence, and (b) mathematical modelling. Loss of potential production may result if AHFPs are not properly identified and evaluated. Many hydrocarbon-bearing formations with AHFPs are erroneously "condemned". 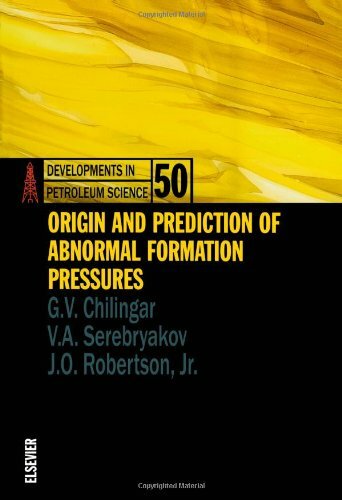 This book is intended for engineers and geologists involved in the evaluation, drilling in, completing, and producing from hydrocarbon reservoirs with AHFPs.